Is your business starting to grow so rapidly you feel like you can’t keep up with orders? At a certain point of growth, most companies are just simply unable to meet the demand of their customers. Today, more and more companies are turning to outsourced fulfillment and warehousing so they don’t have to worry about their growth being interrupted. Outsourced fulfillment and warehousing can add tremendous value to any business that wants to focus on growth and it might just be the secret step for your business’ long-lasting success. What is this going to cost me? That’s the most common question asked by prospective clients. After asking the following 10 questions, we can then get into the numbers. 1.) How much space do you need? 2.) How many orders do you ship per month? 3.) How many items per order? 5.) Do you ship in boxes and envelopes or are the items ready for shipment as is? 6.) Are the items fragile? 7.) What type of void fill do you prefer? 8.) Where are your clients located?How many returns can we expect monthly? 9.) Do you need customer support? 10.) How will you transmit orders? From those questions it is easy to put together a proposal, but is that really what you want? The better question should start off by asking: What do you want to accomplish by outsourcing your warehousing and fulfillment? You see, this question is the single most important factor in building a successful fulfillment program. Speed – How quickly do you want your orders shipped? In today’s highly competitive marketplace, having your product in your customers hands before they have a chance to wonder where it’s at is critical. It’s one of the reasons they will re-order. Failure to ship it quickly can lead to increased customer service costs and lost future sales. Accuracy – Often times, people say they only care about how fast a package gets delivered. Speed is important, but what if an order is incorrect? The client is upset, they email or call you, you or your employees have to research the error, ship the replacement, figure out a way to return the incorrect item, and communicate yet again with your sincerest apologies. The lost opportunity can cost loss of future sales, increased customer service costs, increased shipping costs, and potential loss of reputation. Being accurate is often times more important than being quick. Scalability – Where will you store your inventory? Do you have room to grow? Are you paying for space you are not using? What is the cost of adding another employee? Do you lay off staff when sales are slow and hire on when sales volume increases? 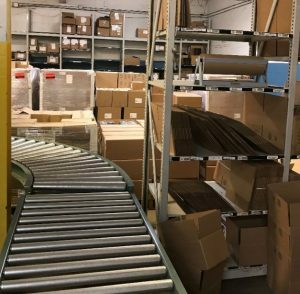 A fulfillment center gives you the flexibility your business needs. Hassle – How often have you visited the USPS, FedEx or UPS websites? Have you ever tried to research the regulations for shipping internationally? How about the regulations for storing and shipping nutritional supplements? Lot or serial number tracking? Do you know what each carrier requires to file a claim? These are just a few of the things that companies like Logistics Plus keep track of. Reducing the headaches associated with storing and shipping your inventory must worth something, right? Time – When you started your business, you dreamed of the freedom that it was going to give you. Now that your business has grown, your free time has become scarce. Perhaps you have been meaning to research your next product line or begin the next marketing campaign that is going to take your business to the next level. If only you had a bit more time to do these things and less time having to manage your inventory, pack boxes, and deal with employee issues. A fulfillment company takes away the barriers that impede growth. You can focus on your core competencies and enjoy the time away from the business as you had dreamed. These are just a few examples of the value add that Logistics Plus Fulfillment Solutions brings to your business. Just for this bit of value you are probably thinking – “they must be expensive!” That could not be further from the truth. At Logistics Plus, we are focused on putting together a customized fulfillment program that not only meets your current needs, but anticipates your future needs. Contact us to get a free, no obligation quote today or click here to download our free fulfillment guide.